Have you always wanted a flawless smile, but you were worried about the time and money you would need to invest in cosmetic dentistry? Many patients believe that cosmetic smile makeovers are difficult and involve costly, complex treatments. For patients at Conklin & Ward Dental Group, we offer a variety of conservative cosmetic treatments, including smile transforming porcelain veneers. If you’re interested in learning more about porcelain veneers or any of our other treatment options, call to schedule a cosmetic dentistry consultation in our Towson dental office today. We’ll sit down with you to discuss all of your possible treatment options and create a personalized cosmetic dentistry plan to deliver the picture-perfect smile you deserve. Veneers are thin sheaths of dental grade porcelain that affix to the front facing surfaces of teeth. Prior to placement, these restorations resemble a fingernail in shape and size, and once in place, they blend flawlessly into your natural smile line. Porcelain veneers are placed over the course of two trips to our office. 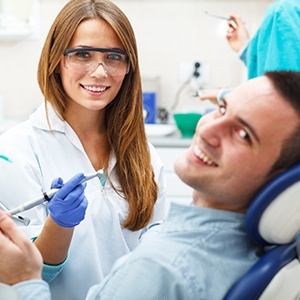 During the first appointment, we prepare teeth by removing a small amount of surface tooth enamel. This ensures the veneers will blend seamlessly into your natural smile line. Once teeth are prepared, we capture impressions of your smile that are used by the dental lab to craft your custom veneers. 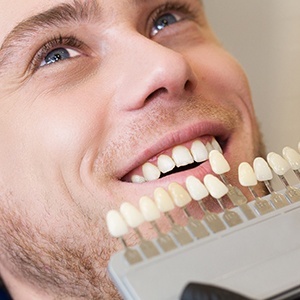 Before you leave the office, we’ll place temporary veneers to protect treated teeth and allow you to get used to the look and feel of your smile with porcelain veneers. During the second trip to our Towson dental office, we’ll remove your temporary veneers and exchange them for the final, custom crafted porcelain veneers. Once in place, these high quality porcelain restorations will look and function just like your healthy, beautiful smile. Do I Need to Care for My Smile Differently? You will be able to brush twice a day and floss as usual once your veneers are in place. We may review your oral hygiene products to ensure you are minimizing wear to your porcelain veneers. We typically recommend patients use a soft or ultra soft bristled toothbrush, minimally abrasive toothpaste, and waxed floss. Because high quality porcelain is stain resistant, patients can still enjoy their favorite foods and drinks, even coffee, red wine, and berries, without worrying about staining. When you care for your veneers properly, they can last ten years or longer before they need to be repaired or replaced. If we determine that your porcelain veneers need to be restored, our team can schedule a consultation to discuss cosmetic dentistry options available to enhance your smile and fix or exchange your damaged porcelain veneers.